I’ve only got a cranky, old, freebie, promotional copy of Dreamweaver 1, which is very buggy & difficult to use, so the work was slow. Quarter sheet Arches Rough 300 gms. It’s kind of a relief, as this act of organising feels like the end of a long cycle of work. Most of them are already sold & gone. Sometimes difficult to get a clear & objective overview.And I tend to work in a what feels like a very stop start kind of way, due to all the other demands on my time : Dad to two young kids, restoring a house (roof to come off soon), running painting holidays, teaching locally & oil painting as well, not to mention my ‘how to paint’ book which is ambling along in a simular stop start way, with the usual fits of self-doubt.Keeping focus all the time isn’t always possible I find. Or one could say, being more generous, that Life bumbles along, so enjoy the ride & the fellow passengers that one finds oneself sharing the wagon with… things always take longer that I imagine. 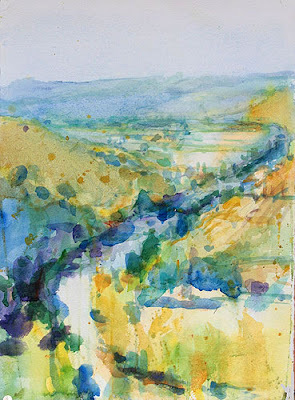 I also imagine some fabulous watercolours that have yet to be made apparent. Some day soon, I hope. Good to be busy with what one loves. 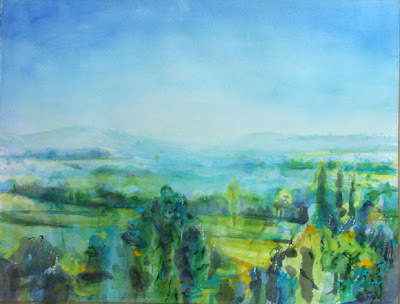 Running two painting workshops here in South West France in 9 days time.